Buddha had a cousin, Devadatta, who was extremely jealous of him. Devadatta felt that he himself was as good as Buddha and was jealous that people ignored him and did not honour him the way they honoured the Buddha. He was always thinking of ways to harm the Buddha. One day he devised a plot to kill Buddha. He knew that day Buddha was going to pass through a particular town. Before the Buddha came into the town, he brought the elephant to the town, hiding it beside a wall. He then fed the elephant a lot of liquor to make it drunk. 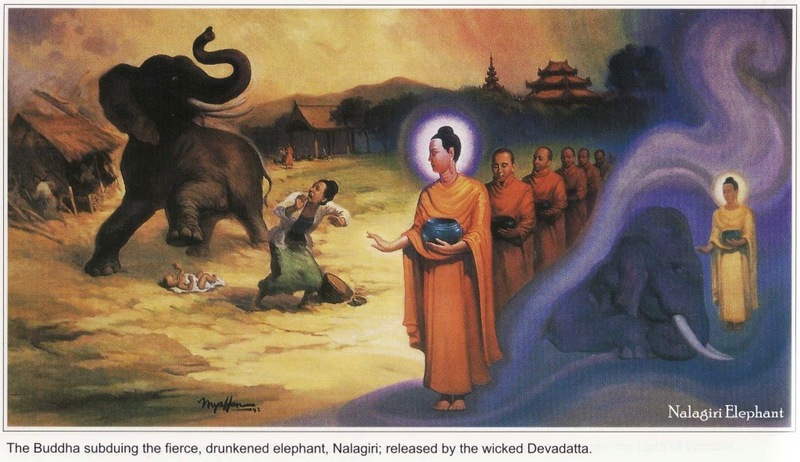 His plan was to make use of the drunken elephant and trampled Buddha to death. 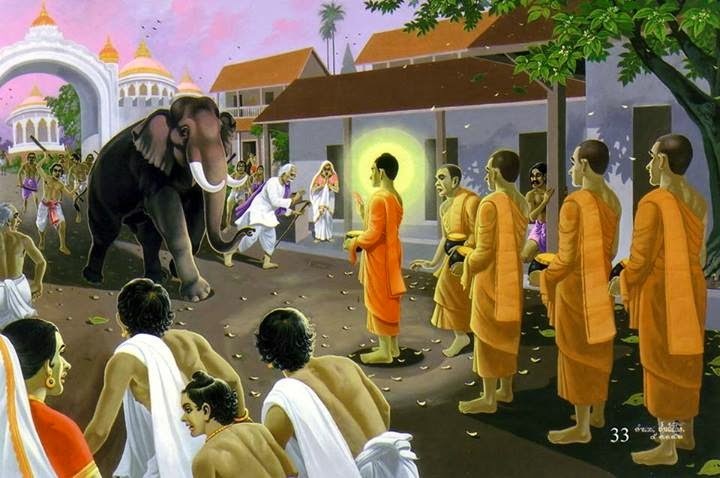 When he saw from a distance that the Buddha was coming, he immediately use sticks to beat the elephant brutally. The drunken elephant was in great pain and was totally enraged. Seeing this, Devadatta immediately released the elephant in the direction of the Buddha. Overwhelmed with anger and pain, the elephant was now mad and started at full speed towards the Buddha. It raised its ears, tail and trunk, making a lot of noise. It was as if thunder was striking. All the disciples who were with Buddha was horrified at this terrible sight and scrambled to flee from harm’s way. Only Ananda, Buddha’s attendant, stood firmly beside the Buddha. At that time, Buddha himself remained totally at ease and composed. He took a look at the elephant and felt great love and compassion for the poor beast. He stood where he was and radiated his loving-kindness towards the elephant. 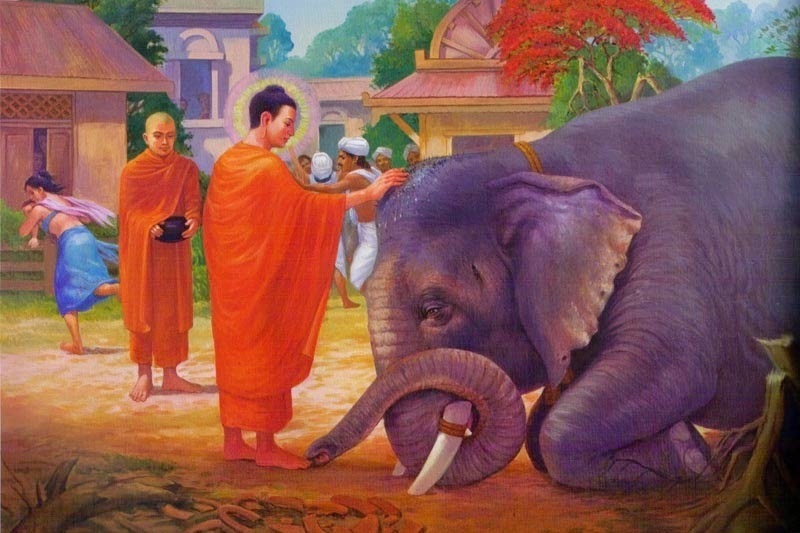 Buddha’s love and compassion was so strong and powerful that the elephant could feel it. Just a few steps before it was about to charge into the Buddha, it stopped in its path and calmed down. It then trotted towards Buddha and respectfully bow its head. Buddha stroked the elephant’s trunk and comforted it with soft & kind words. The elephant was totally tamed.